Biola alumna and current professor Carol Aspling had the opportunity to lead the Southern California Children’s Chorus (SCCC) at the 84th Academy Awards on Feb. 26. During the “In Memoriam” tribute segment they performed backup vocals of “Wonderful World” with Esperanza Spalding, the Grammy Award winner for best new artist of the year. Aspling started working with SCCC shortly after she graduated from Biola in 1994 with a degree in music education. She returned to Biola years later to serve as the Women’s Chorus Director because she appreciates the Christ-centered community. “At Biola, the Word is evident in every aspect of college life. Christ is the focus,” said Aspling. 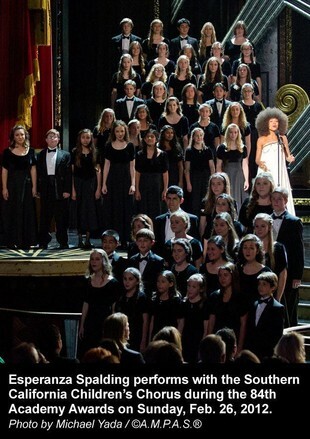 The children’s chorus was invited to perform at the Oscars for their well-known talent and fame throughout California. They only had three rehearsals to prepare for the event, but the students were ecstatic when they pulled up to the red carpet in their bus. The entire week leading up to the Academy Awards was incredible for Aspling and the chorus. They started at Capitol Records with a pre-recording of “Wonderful World” and moved to the Kodak Theatre for rehearsals. The hard work payed off when they received a second applause from the audience after the show went to commercial break. Aspling always had a passion for children’s music and was so proud to see the children on stage at the Oscars knowing that millions were watching. “Watching the children’s faces on stage as the actors watched them. They had an excitement in their eyes,” said Aspling. While many may view this performance as a starstruck experience, Aspling’s love for the Lord and desire to serve helped her view this opportunity as a ministry. She explained that everyone needs Christ, regardless of their celebrity status. The Oscars is a large event where participants have the chance to work with and meet people who need the love of Jesus. During the weeks leading up to the Academy Awards, Aspling prayed that the Lord would help her be a light to witness to the people she met. The chorus was backstage a lot of the time and she said they wanted to serve anyone they could with a positive attitude. The nonprofit chorus has been around for 16 years and Aspling has been working with them since the beginning. They currently have over 300 members within seven levels. The group that performed in Feb. were as young as 10-14 years of age.